Since the last update in this series, there has been a certain amount of drama on our latest road to Real Estate Riches. There’s always drama when you buy a house, because relatively large sums of money are involved, and the sale involves a large number of people working together. A buyer and seller, real estate agents on both sides, a title company, and various inspectors, appraisers, contractors, lenders, insurance agents, and even lawyers depending on where you live. In the likely event that one or more of these people is incompetent, the whole production starts to take on a tragicomic quality, and you laugh even as you slap yourself in the forehead repeatedly and invent new swear words. In our case, when inspecting the house, we discovered that both the roof and the plumbing system were inadequate to pass a standard lender’s appraisal. In a normal sale, the buyer requests that the seller get these items fixed before the closing. But getting stuff fixed is beyond the technical competence of most big, slow banks, so at best you can negotiate additional dollars off of the purchase price. We scored an extra $1000 towards the roof and $500 towards the plumbing, even though fixing these things was already part of our original budget when first touring the house. So that goes straight to profit. But the fact that the house was un-appraisable meant that we had to pay cash for it instead of using bank financing. Paying cash came with the added advantages of avoiding appraisal and lending fees. Also, being an enthusiastic insourcer, I always do my own home inspections, saving a few hundred extra per house. All of this just further reinforces my belief that Cash is King when it comes to running a small business. Other minor annoyances included the unplanned disappearance of several hundred dollars of landscaping materials that were originally in the garage, courtesy of the bank’s unapologetic maintenance contractor who was “just following orders to remove construction debris”, and missed deadlines and slow email responses galore on the part of the title company. Luckily Mrs. Money Mustache is a patient and meticulous real estate pro and she compensated for it all by watching the people and deadlines like a hawk. In the end, it all worked out as it usually does, and on October 25th, the MMM Foreclosure Investment Team closed on the house. 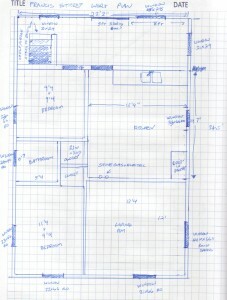 I had already gone through the house and done a rough scale diagram as I always do for renovation projects – this forces me to think through what needs to be done in more detail, and it also allows me to plan material purchases without having to frequently re-measure everything at the site. I keep a copy of this plan on my phone and can whip it out at any time during a trip to the building supply store. 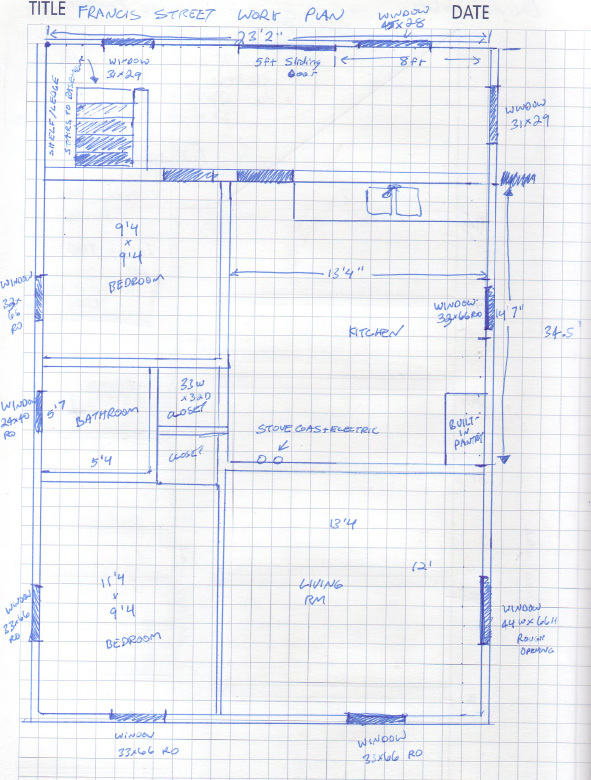 If you’re looking at the plan at left and are curious about the details: the only change we plan to make to the existing floorplan is to add a second door to the bathroom, making it a “jack and jill” arrangement that can be shared from both bedrooms, instead of only accessible from one as it currently is. This requires a full redesign of the bathroom, as it previously had a gigantic clawfoot tub jammed into the undersized room, a grotesquely squeezed-in toilet that was almost touching the side wall, and a miniature pedestal sink with nowhere to put personal belongings. All wrapped in a crooked, soggy, and mold-stained room. And the kitchen will get some more countertop space, since it is just a big room with a single 8 foot countertop strip right now, and a lone fridge and range sitting off in the middle of nowhere across the room. One of my pet peeves in kitchen design is having fridges and stoves that look like a bulky afterthought instead of being integrated nicely to the kitchen. Once I have a sketch, I like to walk through and make a list of what needs doing. Then I type the list into a spreadsheet, and make some conservatively high estimates on the labor and materials to figure out the total time and cost of the project. The simple spreadsheet linked above tells me that we’re going to spend about $13,700 on the carpentry and materials portion of this remodel (including new kitchen appliances), which leaves about $12k for painting, landscaping, and other tasks if we want to stick to the original $25k budget. We did score an additional $1500 off of the purchase price from the bank, which adds to the safety margin of this project. Getting good estimates is pretty important, especially for renovations larger than this one. Since I’ve done all of these tasks many times over the years and always keep spreadsheet records of how long things take, I find that my time estimates are pretty good these days. Yesterday, with the appropriate building permits in hand, I began in earnest on the destruction of the old bathroom. It was a true pleasure, because it was such an incredibly ugly room. The first step was to strip it down to its original plaster walls and wood plank floor, then rebuild from there. This meant hauling out the clawfoot tub (which will be later restored and sold on Craigslist), the toilet, the sink, the weird vinyl wall material, and the stained vinyl floor over top of soggy particleboard. Above you can see a picture from yesterday in the thick of the action. The excellent mess and filth just makes the eventual finished product – a pristine and cozy tiled lair of comfort – all the more satisfying. The next step will be bonding a thick, level layer of structural plywood over the old plank floor, upon which we can build the new bathroom. Part of the fun of rebuilding the bathroom is in fixing all of the haphazard plumbing in the basement. 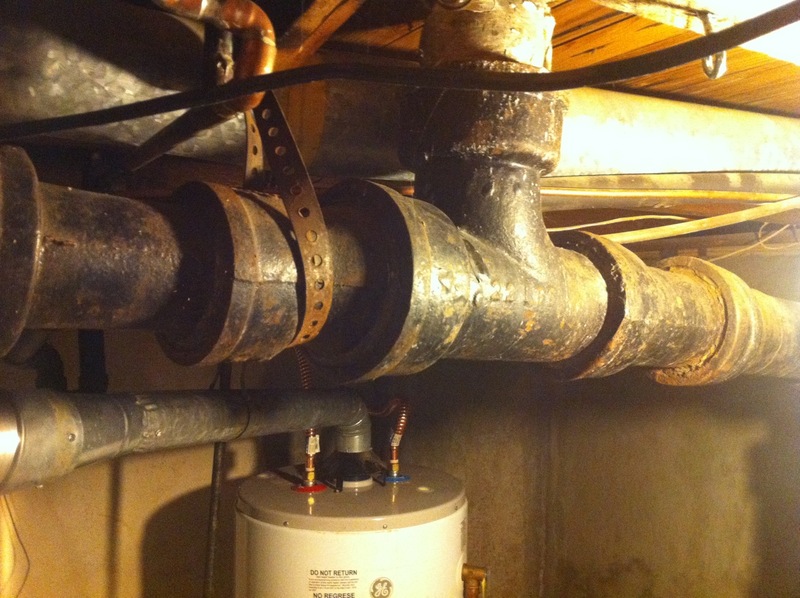 Like most old homes, this house has endured over seventy years of hacking and repairs on its plumbing system. Cast iron is smooshed together with sections of Pure Lead(! ), rusty galvanized pipes join through heavily-corroded adapters to copper, rubber joints splice in various newer parts made from ABS (black plastic). All of it hung loosely from the ceiling and zigzagged at awkward angles. With great gusto, I took a sledgehammer in each hand and crashed them together from opposite directions onto the biggest piece of cast iron pipe*, and kept pounding until every bit was laying shattered on the concrete floor. I pulled out the remaining loose fittings from the ceiling, cleanly cut off all of the spaghetti of copper and galvanized supply pipe, gathered up the 320 pounds of various metals for eventual recycling, and then proudly surveyed my new blank slate. On the next day I’ll begin rebuilding everything in a tidy and easy-to-maintain way. * Remodeling tip of the day: if you’re ever removing cast iron pipes from an old house, use a sledgehammer instead of a saw or grinder – it is both speedy and satisfying. You can probably sell the scrap lead pipes for 50c/lb or easily trade them for beer/services with people who cast lead bullets. They’re always on the lookout for a good source of lead and many I know keep a close eye on Craigslist for such things. I’d be making an offer if I was local to you. I enjoy reading this in real time. Thank you for sharing. PEX and doing plumbing might be easy for you to cover in one post, but for me it’s still too much. Like anything, one you know it, you know it. Like where do you put the hole for the toilet, and is there clearance under the house? I wish I lived in your area to come and help. I love learning and it looks like it’s going to be bringing you a nice steady income when you’re finished. Real estate can be a headache, but it can be extremely rewarding. I was riding my motorcycle around Long Beach today and looking at all the cool properties. I made some good money prior to the fall in prices, but do I feel sadness for one of my deals that fell through. I was thinking it may have been a good thing, I might not have handled such a high monthly income. I’ll be doing the same thing in a few months. The last property I fixed up went from being the ugliest eyesore in the neighborhood to the nicest. The neighbors came out and thanked me and my partner for fixing it up. Now it’s rented for $2150/mo. I’ve saved up funds for another cash buy and I’m looking for an ugly monster of a house to buy. Please keep us posted on your progress with this house. You are a better craftsman than I and it gives me something to shoot for. Great stuff, keep us updated :) A bathroom remodel is in the works for the condo I bought here as well so I hope to be able to get some useful advice. I love these sort of articles, and whilst I have the will to do major DIY, I fear that my skills are woefully inadequate. If I were local to you, I’d be offering free labour in return for tuition in these skills. A quick addendum to my earlier reply… On your drawn plans, I see that you have marked windows; why don’t you mark the doors and how they open? Haha.. good point about the doors. I scanned the plans before I drew in the doors. I did draw them eventually, I guess I’ll just have to re-scan. For now, you can use your imagination. Some of the current interior doors were made to a non-standard size – the top of the frame is only six feet from the floor (standard is 6’8″). I will probably frame in proper doors to replace these, because it creates a weird claustrophobic feeling right now (plus I keep hitting my head when I pass through them). I am really going to enjoy this series. Especially since this house “resembles” ours in many ways (also almost 70 years old). Our kitchen also had one single row of countertop with a sink. HOwever, the other wall didn’t even have any kind of stove or fridge – previous owner took them both. That allowed us to design where to place them, and then my spouse built cabinets to fit. I find the worst thing about old houses to be how haphazard the kitchens (and sometimes baths) are. So many old homes that I’ve toured have the stove and fridge butted up against one another, with no counter to speak of. Who can cook like that?? very interested in the PEX info….my house is all copper…so i have never ventured into PEX yet…. I just wanted to let you know I’ve been reading your blog recently and have found it really inspiring, both from your frugality and your home renovation projects. Real estate renovation is something that I’ve always wanted to do, but never had the will or the capital to do so. Your blog has given me a blueprint for getting there. Will be following your foreclosure project with great interest! Knowing what you can take on in terms of renovation, and being able to handle the bathroom, is impressive. I was thinking aboutbuying ahome earlier this year, and all the houses I loved were the older ones, but required work, and I’m not sure I’d be able to do even a simple repair now! It looks like a nice project, and satisfying when you’re done and it looks so much better! Put me down as a potential audience member for a plumbing how-to post. I would definitely like to learn about that. As a DIY-er, new reader of MMM, and a first-time homeowner (supposed to close in about an hour), I’m very interested in this series. I look forward to reading your article on the PEX installation. I’ve heard how easy it is to install, but haven’t ever messed with it myself. In general, I hate plumbing work. I never know how tight to get things, because I’m always afraid of breaking the plastic pipes (or not getting it tight enough and making a mess). I love this series so far. Keep it coming! Terrific series and post. My wife and I are considering venturing into rental property land yet again after hearing a friend’s story about his latest purchase (bought for $25k, + $5k of renovations and rented for $750/month) and realizing her parents are probably going to need a place to rent soon. Just not sure if we have quite enough (time & money) saved up yet. Good question! By adding the plywood, I’m really just re-creating the standard subfloor that most new houses (in the US) have. There is no concrete flooring in this house except in the basement. Right now, there are floor joists, then a perpendicular layer of 3/4″ fir planks from the 1930s. In the adjacent bedrooms, there is 3/4″ oak floor on top of this, but not in the bathroom. So I add the 3/4″ plywood to bring everything up to the same level, and screw it down with many many screws to make it as rigid as possible. On top of this, I’ll add the tile (using “Flexbond” tile mortar which is sturdy enough to bond directly to plywood), and the end result will only be a little more than 1/4″ above the bathroom floor level – a rise that will be hidden with a ramp-shaped oak threshold stained to match the oak floor. I see, thanks! Here in Europe, almost all floors are concrete. The problem with this is that it is rarely an even surface, so you usually need to pour some liquid cement over it. An alternative would be to put plywood or cement boards on top, however you’d need to do that to the whole floor to be level. I’m just not sure if for example a cement board is hard enough not to crack under a 300kg gardrobe..
Youre making ME have Construction Dreams! And I am a ballet teacher! Sounds very fun and satisfying. I may have to acquire some manly skills. Not sure if you’ve ever tried a soil-pipe snapper, but we used one of these when remodeling plumbing in two of our old houses. 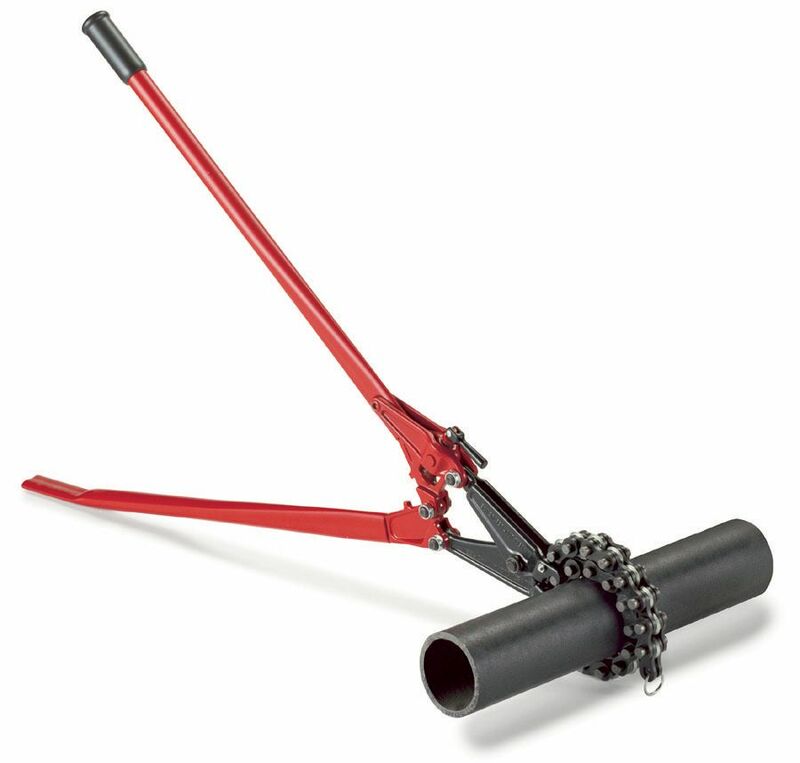 You wrap the chain around the pipe, and use the handle as a lever, like a car jack. With great excitement you pump the lever several times, which tightens the chain until *SNAP!! * — the pipe submits to your bidding and is neatly broken in two! By the way I love the blog! Dutifully poring over every post from the beginning and applying many of your handy truths and tips. Thanks for all the great writing & adventures! Haha, sounds much like the project Mr. Weedy and I are currently undertaking at http://littlebeau.weebly.com. 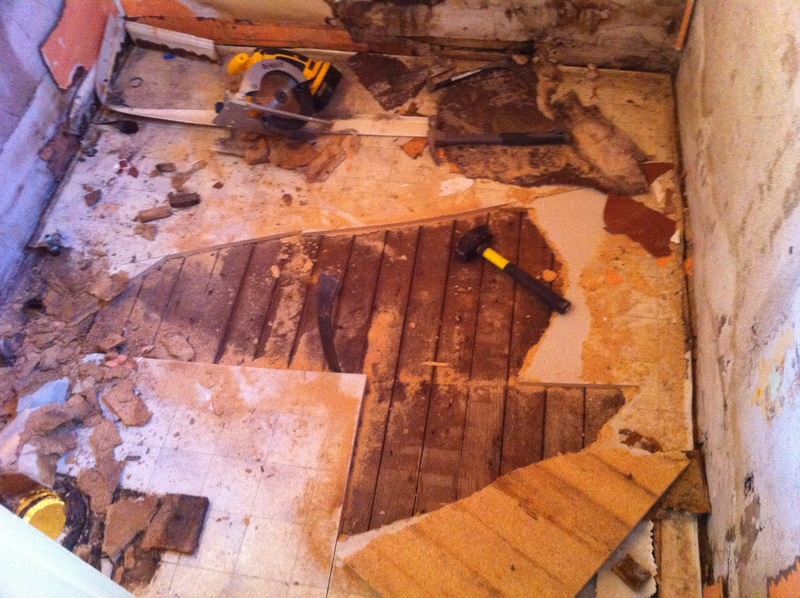 Only our bath floor was soggy and rotten down to the floor joists. I look forward to reading more progress reports as I wend my way through your posts, even if it is a couple years after the fact. Did you ever complete the mentioned writeup on the PEX/ABS install for the bathroom. I cant seem to find it anywhere. Yes. Same as above. We would love to see plumbing post, your shower post was one of the best explained DIY shower pan I’ve seen on the internet. Did you do a plumbing post that we can’t fine? Thanks! I’m pretty sure in my state (Taxachusetts) you have to have a licensed plumber do the work, or at least sign off on it, to get approval from the inspector. As an electrician I’ve had people ask me to sign off on their work, but it’s a pretty hairy thing to attach my name to someone else’s work unless I know them well. I did a bunch of work in my house when I first bought it and it was extremely satisfying, but I did hire a plumber to make final connections. Since he is the younger brother of a good friend, it worked out great!